I came across “Shield of David” during the course of family tree research. Part of my paternal family lived in Gomel, Belarus as the 20th century began. This is the same city where the recently deceased gadol hador (leader of the generation) Rav Eliyashiv was born and lived and had a population of Jews everywhere between very Torah observant to secular to marxist to communist … and zionist somewhere in there on the latter side. Back in 1903, around the time my great-grandfather left for the United States, there were large pograms against the Jewish people in the city. For what was probably the first time in quite a while, a group of Jews banded together to form a militia or army to fight back against those coming to do them harm. This would have worked well except when the Russian army came to quiet things down, they attacked not only those who were part of the pogram, but also the Jews who were defending themselves. The Jews decided it wouldn’t work to form their own army on foreign soil, so they left for Israel. What started as individual communities with military training, become the various militant groups that become the IDF (Israel Defense Forces). There’s a lot of very interesting points on how the wars were fought, where the help came from, and the political relations with the United Kingdom (which varied between near-outright support of the Jews and near-outright support of the Arabs), but I’d like to focus on a few points . . . According to Allon, a general in the Israeli Defense Forces, the practice amongst Jewish settlements was to hire Arab calvary for defense. The Turkish Empire was crumbling and settlements, whether Arab or Jewish, each needed defense. When the militia from Gomel came to Israel, they decided they were going to defend themselves and more – no Arab labor and no Arab defense. This upset the “status quo” and the Arabs attacked until they realized this group of Jews meant what they said and defended themselves. Thus began, in many ways, the tensions that still exist between Arabs and Jews – typically, Arabs are fine with a Jewish presence and even respect religious Jews (I have quite a few Arab clients, some of whom have told me they specifically sought out a religious Jewish lawyer), but demand to be in control. Even more parenthetically, Fawaz Turki quotes his interview with a leader of Hamas that their desire is to take control of Israel, but they would allow the Jews to remain living under their control. It seems, in over 100 years, not much has changed in this picture. In Meah Shearim, known to be a very religious neighborhood just outside the Old City of Jerusalem, I once had a long conversation about zionism with Toldos Aaron identifying Chassidic Jew. He said before 1948, the Jews and Arabs used to go to each others weddings . . . the coming of Zionism and secular Jews only made things more difficult for them and caused fighting. In a hypothetical, I wonder what would have been, had the Jews settled Israel en masse just the same, but had made a priority of better neighborly relations. 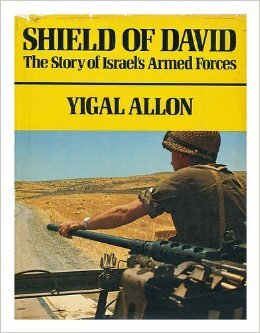 Allon’s book, written in 1970, also describes the beginning of religious-secular tensions even among Jews in Israel. (We have it here in the United States, too, but the secular Jewish community is largely ambivalent and disappearing due to birthrate, inter-marriage, and larger and larger attrition in each subsequent generation.) Allon describes how in 1948 Israel tanks rolled through Tel Aviv in a procession … right past a synagogue. He describes this as a replacing of the old with the new, in juxtaposition. That is, 3,300 years of what it meant to be a Jew is suddenly replaced with Jews meant to make nationalism their religion. Other religious references made include an outpost which kept being destroyed by the British, only to be rebuilt each day … even on the Sabbath. While it’s nice to know that the Sabbath was being observed in some form, the implication is that settling the land became paramount. So too, there is a passing reference that there were “even” some wearing yarmulke’s dispatching on the radio. The attitude, unfortunately, still prevails in much of Israel. It has led and, unfortunately, continues to lead to action and reaction from both sides, distrustful of the other. Secular parties often still try to push nationalism on the religious, failing to understand how and the religious see their role in the Jewish people, and the religious may make the secular feel lesser for not properly guarding Torah and mitzvos, the paramount thing for a Torah observant Jew. The book is certainly an entertaining and informative read. Seeing how an army and a country develops from people who escape persecution to found a new country is not only amazing, but is unheard of in history. The Torah tells us that the Jews will return to the land, and is on this basis that the Jews did so, either because it was believed or is G_d-guided or both. The irony is that those who did so were largely the secular who strongly knew and felt their Jewishness and had ingrained within them such Jewish values as living in our home, but the irony is that zionism was largely setup to copy other nations and how they live. Yigal Allon makes the above quite clear. This mix makes for a tension with the neighbors who wonder what the Jews are doing there if they’re not religious, and of course, with the religious. Today’s secular Jews don’t even know who they are. There’s no strong Jewish identity “just because” (nor much else of any tradition which remains “just because” in Western society). Further, you’re pretty terrible at rebelling if you don’t know what it is you’re rebelling against. Yigal Allon at least had some idea.